In response to the ongoing federal government shutdown, Arlington Public Library may waive outstanding overdue fines for furloughed federal employees until further notice. Affected patrons should visit any Library location (or call 703-228-5940) and provide a valid federal employee ID. Arlington County Offers Assistance for residents and businesses affected by the federal government shutdown. Arlington Public Library locations offer free meeting room, public computers, comfortable seating and study space for those unable to access their regular office space. All Library locations offer free daily events for adults and children. Free tax preparation is available starting February 1 during select times at Central Library and Columbia Pike Branch Library. How do genetic research, historic interpretation and culinary history intertwine? Join food writer, Judaic studies teacher, culinary historian and James Beard Award winning author Michael W. Twitty as he takes us on a journey through African-American cooking and personal discovery. Thursday, Feb. 7, 7 – 8:30 p.m. 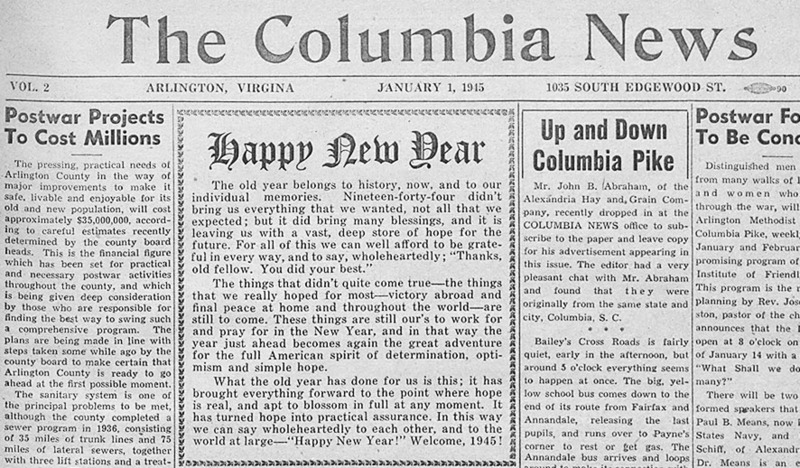 This January 1, 1945 message of hope was made during World War 2, from a short lived, hyper local newspaper called the Columbia News. To see more historic newspapers like this one, visit us at the Center for Local History located on the 1st floor of Central Library. The Center for Local History has a large collection of holiday themed postcards from the early-to-mid 20th Century. Most are colorful, ornate, and have a slogan of merriment wishing the receiver good tidings, like this one. There are also postcards for birthdays, New Year’s, Valentine’s Day, Halloween, St. Patrick’s Day, and the Fourth of July. The first American postcard was pressed in 1873. Postcards quickly became an inexpensive form of communication, growing in popularity throughout the 19th and 20th Centuries. They are still sold around the world as a way to share the story of your journey and adventures, or to just send a “hello” to your loved ones. To see the postcard collection, or learn more about Arlington’s diverse history, visit us at the Center for Local History located on the 1st floor of Central Library. What Was Most Popular in 2018? We're declaring it official - Arlington is a book town. So which titles had Arlington turning pages, and staying up way past bed time? Arlington loves politics, thrillers, literary fictions... and Elephant and Piggy! We read and watched our way through these top 100 titles for adults, kids and teens. We love historical fiction, literary fiction, speculative fiction, spy thrillers, southern odysseys, sweeping sagas, coming of age tales, dystopian nightmares - and everything in between. Arlington read about politics, class, education, leadership, eviction, more politics, code breaking, science, the FBI, cleaning, dying, art, and so much more.